Made in the USA, ProBEAM® Headlamps offer the latest in engineering innovation with a modern and sleek design. Low beam consist of six high power advanced optical D lenses and a position light. High Beam keeps low beam illuminated and adds four additional LEDs with optical D lenses and six more LEDs with projector lenses for an incredibly wide optical pattern producing an ideal beam pattern with illumination down the road as well as on either side. Made from a heavy-duty, light-weight die-cast aluminum, the low-profile housing requires no trim ring and offers a plug and play installation. ProBEAM® Headlamps are SAE, DOT and ECE Compliant and are backed by the Custom Dynamics® Lifetime LED Warranty. These premium headlamps are available with a Chrome or True Black Finish and durable Polycarbonate Lens for long term durability. Custom Dynamics® ProBEAM® LED Headlamp is designed for installation on 2013-Earlier Harley-Davidson® Road Glide® models with OEM 5.75" dual headlamps. Kit includes dual ProBEAM® headlamps with fairing mounting plate and support bracket. 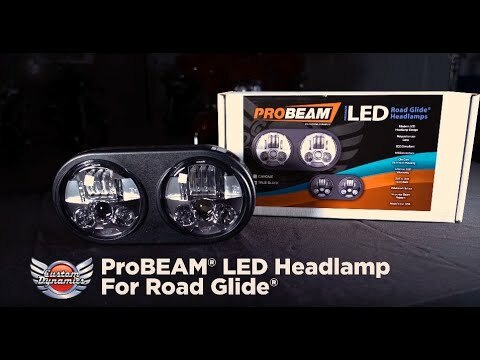 Custom Dynamics® ProBEAM® LED Headlamp is designed for installation on 2013-Earlier Harley-Davidson® Road Glide® models with OEM 5.75" dual headlamps. Kit includes dual ProBEAM® headlamps with fairing mounting plate and support bracket.